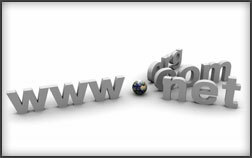 The first step in creating or expanding your on-line presence is to register a domain name. Your domain will be the new home of your website, and the domain name will be the address to your new website. Domain parking is a way of securing a domain name, and storing the domain for later use. We can park your domain for you, until you are ready to use it. Domain pointing is when multiple domains, or addresses, point to a single address. We can point your new domain to your existing domain.